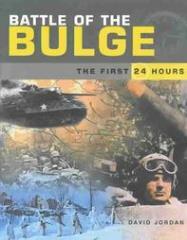 Battle of the Bulge: The First 24 Hours tells the dramatic story of the first day of the Ardennes offensive, explaining in detail how the Allies were taken by surprise and the events that occurred along the length of the front as the Germans attempted to break through the Allied lines. The book begins with an overview of the situation in the west in late 1944, describing the German plans as well as their successful efforts to mask the build-up of their forces.It also examines the Allied high command's complacency, highlighting how they became lax in their attention to Ultra decrypts, leading them to believe the Ardennes region was secure. This is accompanied with an in-depth analysis of Hitler's strategy and the dispositions of both the German and the American forces in the Ardennes region in December 1944.